DALLAS (AP) The hometown kid ensured that San Antonio coach Gregg Popovich would get a milestone victory in Dallas. 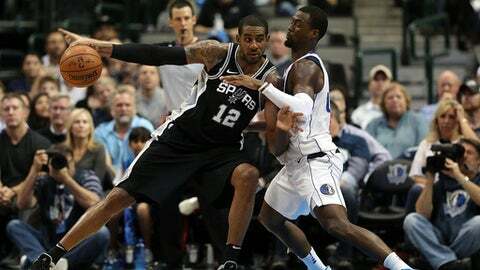 LaMarcus Aldridge scored a season-high 32 points in his hometown and the Spurs beat the Mavericks 97-91 on Tuesday night. Popovich became the fastest NBA coach to 500 road wins. He got there in 835 away games, 41 fewer than Pat Riley. Those two and Don Nelson are the only coaches to win 500 on the road. Aldridge, a product of Dallas’ Seagoville High School, scored eight points during a decisive stretch of the fourth quarter. He’s averaging nearly 23 points per game this season while San Antonio has been without starters Kawhi Leonard and Tony Parker. Aldridge’s coach notices the change in the forward’s second year in San Antonio. Patty Mills added a season-high 19 points for the Spurs. Rookie Dennis Smith Jr. led Dallas with a career-high 27 points, and J.J. Barea and Harrison Barnes had 16 each. The Mavericks are 2-13 for the second straight season and fifth time overall. Just like in a loss to Cleveland on Saturday, the Mavericks cut a double-digit second-half deficit to one point, but couldn’t gain the lead. After Dallas got within 62-61 early in the fourth, Mills hit a long 3 and a driving layup, then Aldridge scored eight of his team’s next 13 points to put the Spurs up 82-71 with 5:03 to play. Dallas never got closer than four points down the stretch. The Spurs led by 11 during the third quarter, but Barea made back-to-back 3s and fed Salah Mejri an alley-oop pass for a layup as Dallas closed the quarter on a 9-0 run to get within 62-60. Mills scored 13 points in the first six minutes of the second quarter, including three 3s. Aldridge was hit with a technical foul with 3:33 left in the second quarter for shoving the Mavericks’ Salah Mejri after a scrap under the Mavericks basket. The Spurs led 44-39 at the break. Mavericks: Dallas continues to play without guard Devin Harris, who missed his second straight game with bruised ribs, and Dorian Finney-Smith was also out Tuesday with left quad tendinitis. Spurs: Travel to Minnesota for the second half of a back-to-back Wednesday night. The Spurs have won 12 straight against the Wolves, dating to 2014. Mavericks: Also face the Timberwolves next, at home Friday night. Minnesota won the team’s first meeting on Nov. 4.